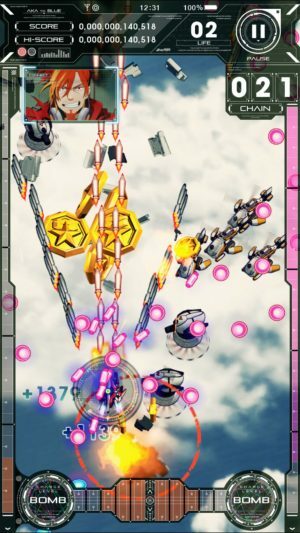 It has been a bittersweet couple of months for fans of iOS shoot-em-ups. The removal of 32-bit support in the latest version of iOS effectively took out a swath of stunning games in one fell swoop, most notably the entire library of amazing arcade ports of Cave’s games. On the positive side, the latest in the Danmaku Unlimited series released, and it was every bit as incredible as we could have hoped. Well, we can chalk another one up for the angels with the international release of Aka to Blue ($7.99), a brand-new bullet hell ballet from Tanoshimasu, a small developer founded by ex-Cave staff. The team’s pedigree shows. This game could easily slide into Cave’s line-up without much effort, even if it’s not quite as rich in extras as some of their mobile ports. 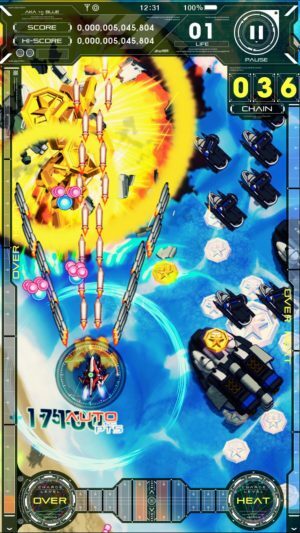 You can take your choice of two fighters, Aka and Blue, through five stages of vertically-scrolling shoot-em-up action. The bullets fly hot and heavy, and the only way you’ll survive is by mastering the game’s main hook: its bomb mechanics. Unlike most Cave shoot-em-ups, bombs aren’t discrete items to pick up and use in Aka to Blue. Instead, you’ll charge them up through a variety of methods, with each level bringing a longer-range, bigger blast that erases bullets and sends score items pouring out of the enemies. Since one of the ways you can charge up your bomb is by destroying enemies and absorbing their shots, careful use of the bomb can give you a near-perpetual supply for great stretches of the game. Even a level one charge is sufficient to protect you from damage once, or erase the bullets in your immediate vicinity. The two fighters are distinct characters with their own personalities, but from a gameplay perspective, the difference lay in their main weapons. The boisterous Aka has a wide shot that is great for cleaning the screen of smaller enemies, while the cool Blue fires a narrow beam that does more damage in a considerably smaller path. Regardless of your choice, you’ll still be facing the same five stages. Indeed, the two even share progress. If you can make it to a stage with one character, you’ll be able to start a new game from that stage with either from that point on. You’ll also be seeing and hearing plenty from both characters no matter who you’re in control of. Unfortunately, none of the voice acting has been translated, so if you can’t understand Japanese you might just want to switch off the story in the options menu. 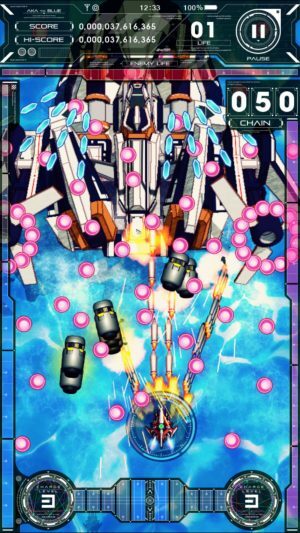 Five stages may sound a little thin, but it’s pretty much standard for arcade shoot-em-ups. First of all, most players are going to find each and every stage as tough as nails to clear, and unlike most of the Cave iOS releases, you can’t credit-feed your way through Aka to Blue. You can start a new game on the highest level you’ve previously reached, but you’re going to have to clear each stage honestly. If you have the skills and know what you’re doing, you could get through the entire game on a lunch break, but getting to that level is going to take a whole lot of practice. Once you are at that level of play, it then becomes about getting the best score possible. In that respect it’s as replayable as any of Cave’s games. Or it would be, were it not for one nasty omission. While they don’t connect with everyone, I’m a big fan of score attack games. Games like this, however, live or die based on the player’s desire to constantly better their score. While that can take the form of competing with one’s own self (and indeed had to in many home conversions before internet connection became regular features), it’s generally more interesting to go up against other humans. I realize that Apple has been de-emphasizing Game Center over the last while, but Aka to Blue really could use leaderboards of some kind beyond the simple local high score charts it has. The lack of such is probably one of the biggest negative points of the game. Other than that, I have a hard time finding much to criticize here. The 3D graphics are going to fly well with most people but have others pining for the good old days of meticulously-detailed pixel art. The soundtrack is, as usual for the big dogs of this genre, absolutely jaw-dropping, backing your every move with shredding guitar licks. I appreciate the inclusion of a graphics slider so that players can make their own decisions about how much they want to push their hardware, and the game also includes a number of control options so that you can find something that’s right for you. I wish the developer had translated the dialogue of the story in some way, as having the characters shouting in Japanese with no sub-titles throughout the whole game is probably not going to work for a lot of players. As much as I want to give Aka to Blue my highest recommendation, online leaderboards are a major feature for score attack games and they really ought to have been included here. That may not matter to some of you, of course, and if that’s you, then you can feel free to jump in head-first. Even if you do care about leaderboards, Aka to Blue is good enough in every other respect that anyone who enjoys a good shoot-em-up needs to pick this up. I find it amazing that the former Cave staff could slide so seemingly effortlessly into producing Cave-quality shooters, and I greatly look forward to whatever they’re working on next.